Click Pic to see one of Brad's FUN Videos!" 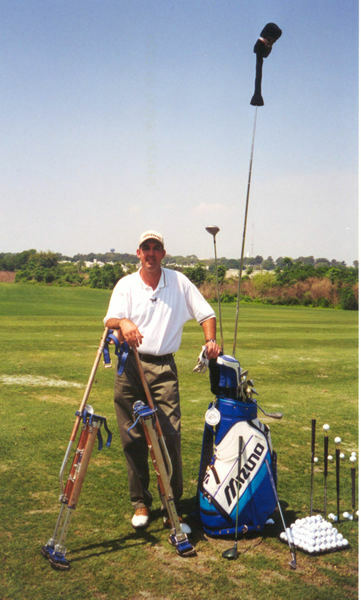 GOLFWEEK MAGAZINES' "GOLF ENTERTAINER OF THE YEAR"
Brad Denton has over 20 years of experience as a playing professional, teacher and entertainer. Through his comedic golf show and character impersonations, Brad entertains for the world of corporate and charity golf. Events including Corporate, Charity Fundraisers, Junior Camps, Club Member/Guests, PGA Tour events and more. Brad has performed before national television audiences on shows such as 'The Golf Channel', 'Real TV', 'Ripley's Believe It or Not’, and Fox Sports Networks ‘You Gotta See This’. Clean fun and informative golf entertainment with a "twist." Within the structured format, Brad uses his fun-loving clean sense of humor, impersonations, quick wit and shot-making talents to entertain and teach groups of all ages and backgrounds. His incredible trick shots demonstrate the fundamentals of the golf swing ‘with a twist’. 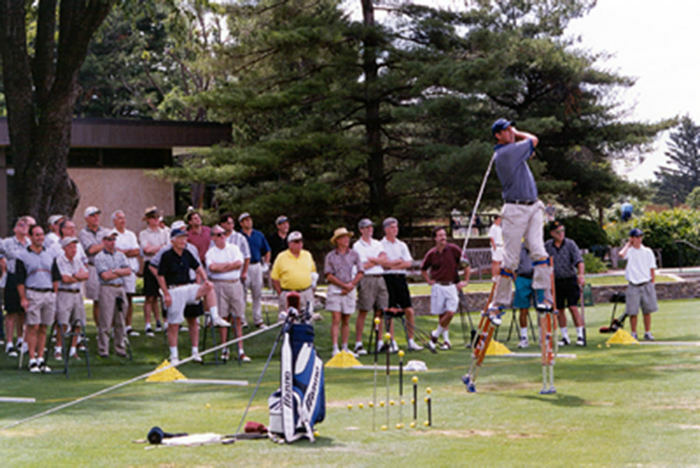 Using a variety of not so ordinary clubs such as a 6 foot driver and a 10 foot driver hit on stilts, Brad helps golfers improve their swing mechanics as well as strengthening their stomach muscles through vigorous laughter. When you book Brad, you also get Forrest Gump, Gomer Pyle, Jack Nicholson, Sean Connery, Jimmy Stewart, Arnold Schwarzenegger, Elvis and a host of other characters. His dead on impersonations will leave your audience in stitches, while he performs an incredible, one of a kind golf clinic trick shot show that is guaranteed to knock your socks off. "Comedy Golf Instruction with a Twist"